The MR7 instructions can be viewed here. Pulsed Frequency™ Magnetic Software currently works with the MR7, manufactured by Wellness PEMF (www.wellnesspemf.com). The MR7 is a pulsed magnetic field wellness device that has seven channels, each of which generates a magnetic field of a specific frequency. It is light weight, pocket size, and has a rechargeable lithium ion battery similar to a cell phone battery. It is also programmable and capable of storing multiple wellness programs. Pulsed Frequency is hopeful that other manufacturers will produce electromagnetic devices that can utilize Pulsed Frequency™ Magnetic Software in the future. If you’re running the software for the first time, you will need to press the “Check for File Bank Updates” to download the most recent set of frequency files. Skip to Checking for Updates for more information on keeping your frequency files and software up to date. To view any frequency files that are currently loaded in your attached device (see Installation Instructions for more information on detecting and attaching your device), click the “Frequency Files in Device” button on the home page. 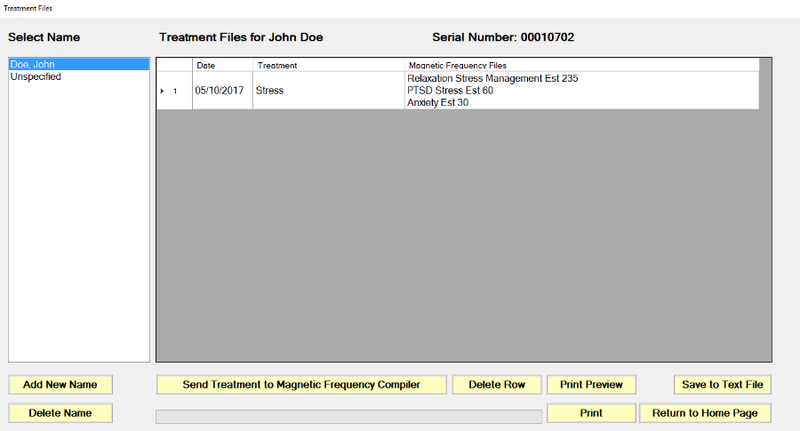 Compiled Magnetic Frequency Program Loaded: If there is more than one file loaded in the device, this field will only display an asterisk (*). When there is only one file, you will see the name of that file here. Total Time: This is the total time (in minutes) that the listed frequency files will run on the device. This does not include repeats. In this example, the three frequency files will run for a total of 325 minutes. If the device is programmed to repeat, the 325-minute set of files will run again for as many times as you’ve programmed it to repeat. File Table: This table displays a list of frequency files that are currently loaded in your device. The “Duration (minutes)” column shows the time that each file runs before moving to the next file. 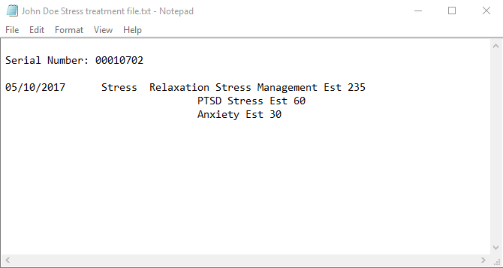 Files are listed in the order of their play sequence, so, in this example, Relaxation Stress Management Est 235 runs first, followed by PTSD Stress Est 60, and finally Anxiety Est 30. Device Attached: This is the frequency generator device that is currently connected to the computer. In this case, it is an MR7. Serial Number: This is the serial number of the device (not the software). 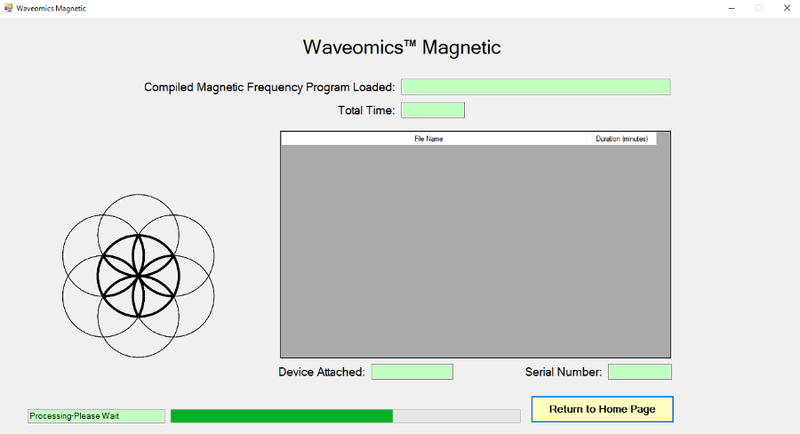 To view all frequency files that are available for loading into your device, click on the “Magnetic Frequency File Bank” button on the home page. 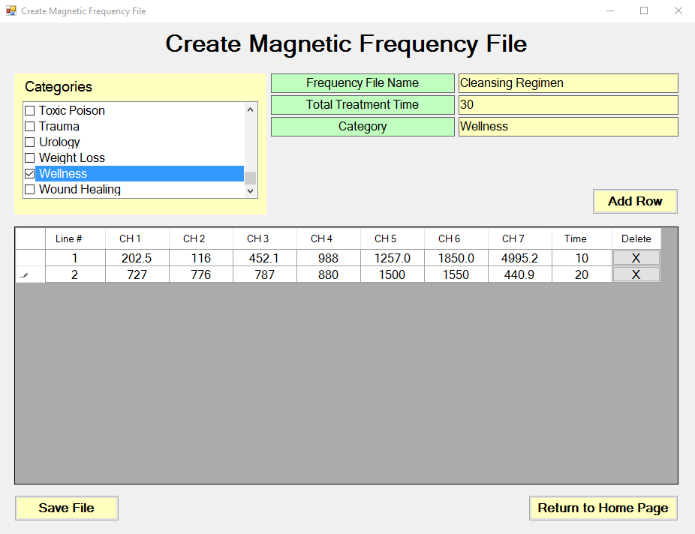 The “Magnetic Frequency File Bank” screen lists all magnetic frequency files by category. Categories are displayed on the left and files are listed on the right. In this case, the “A-Z All Magnetic Files” category is selected on the left and the files it contains are shown on the right. All categories contain files by default except A-Z Combined, which is empty when the Pulsed Frequency Magnetic Software is installed. When you create your own frequency file compilations with the compiler, they will automatically be placed in the “A-Z Combined” category. “Joint Wellness” is the program name. "Est" indicates that this frequency file is an established (Est) file that cannot be overwritten or deleted. All files that are included with the downloaded file bank are established. “933” is the duration of the frequency file in minutes. In this case, the file plays for 933 minutes. “(249)” denotes the number of lines contained in the frequency file, so this file has 249 lines that run one after another. To see the individual frequencies that form a frequency file, select the file by clicking its name, and click the “View Frequency File” button at the bottom of the screen. Each line of the table on the spreadsheet screen represents a set of seven frequencies (channels) that run simultaneously. When one line finishes, the next line runs, etc., until all lines have run. After this line runs for four minutes, the following line, #2, runs for four minutes, #3 runs for seven minutes, etc. To load frequency files into your device, click the “Compiler” button to bring up the magnetic frequency file compiler screen. 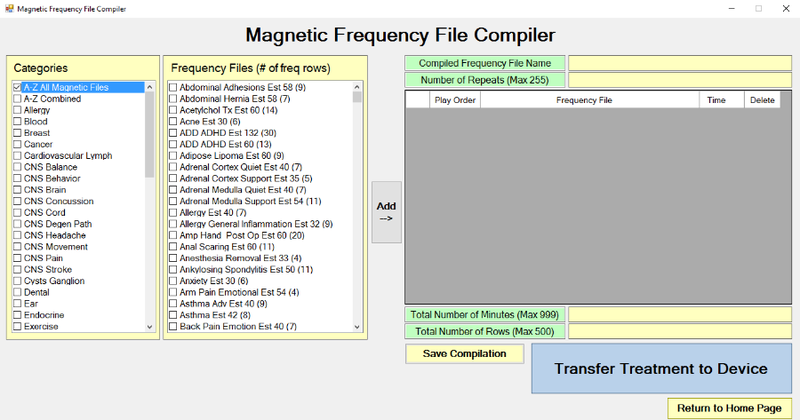 The compiler displays all magnetic frequency files by default. You may scroll through the entire list or narrow it by selecting a category in the left column. To add a frequency file to the list of files you wish to load on your device, select the file by clicking to highlight (you may only select one file at a time). Once the file is highlighted, click the “Add” button to add it to the table (play list) on the right. The “Compiled Frequency File Name” field will automatically be populated with the name of the frequency file you’ve added. You may add multiple files—the files will play in the order that they appear in the table. The total number of minutes may not exceed 999 and the total number of rows may not exceed 500 (both values are denoted below the table). See Frequency File Names for more information about rows and times in frequency files. You may change the play order of frequency files by dragging and dropping them above or below each other, and you may remove files from the play list by clicking the “X” in the “Delete” column to the right of the corresponding file name. Once you’ve added more than one frequency file to the play list, the “Compiled Frequency File Name” field will be empty. You will need to type a name into the field before you can transfer the compilation to your device. You will also need to type a number between 0 and 255 into the “Number of Repeats” field. To play the list of files only once, type “0” into the field, which means the list will play once for the total time with no repeats. To repeat the play list indefinitely, type “99”. This is an arbitrary number that ensures the files will continue to play repeatedly until the device loses its charge. Once you’ve given your file compilation a name and a number of repeats and you’re ready to load it into your device, click the “Transfer Treatment to Device” button. After pressing the “Transfer Treatment to Device” button, a smaller “Name Bank” screen will appear above the compiler screen. If you are the only person using the software, you may select “Unspecified” (or any other name you may have added earlier) to initiate the transfer. 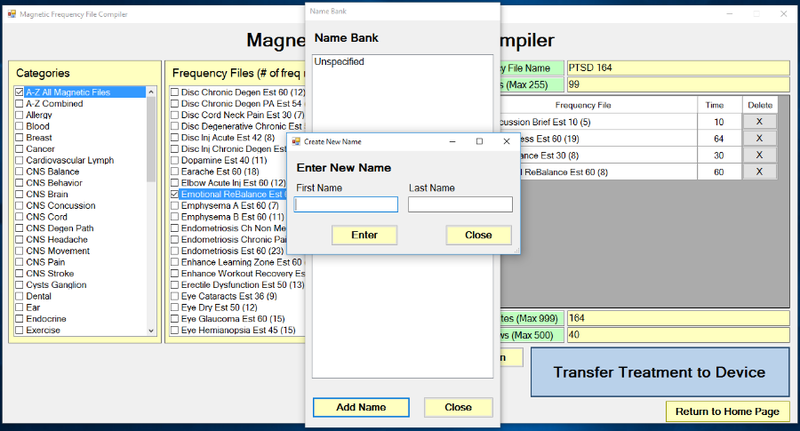 If there are multiple people using the software, you may wish to keep treatment files separate by adding multiple names (which represent different people or names) to the name bank. To add a new name, click the “Add Name” button to bring up the “Create New Name” dialog window. After typing in the name fields, click “Enter” to return to the “Name Bank” dialog. Once you’ve added your name, it should appear in the list on the “Name Bank” screen. You may then select the new name to initiate the transfer. After initiating the transfer, you will see a new screen with a green “Processing-Please Wait” progress bar. 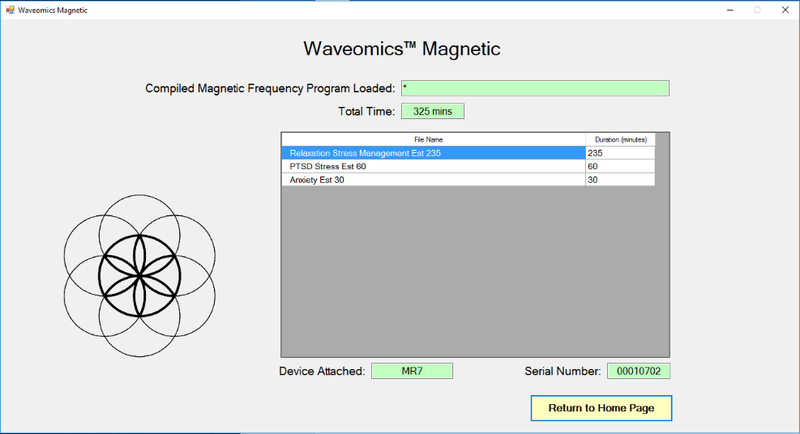 Once the files have finished loading, you will see the name of your file compilation in the “Compiled Magnetic Frequency Program Loaded” field along with the total time below it. You may alternatively save your file compilations to use later if you don’t want to load your device immediately. After preparing your play list and giving it a name and number of repeats, press the “Save Compilation” button and follow the Name Bank instructions above. 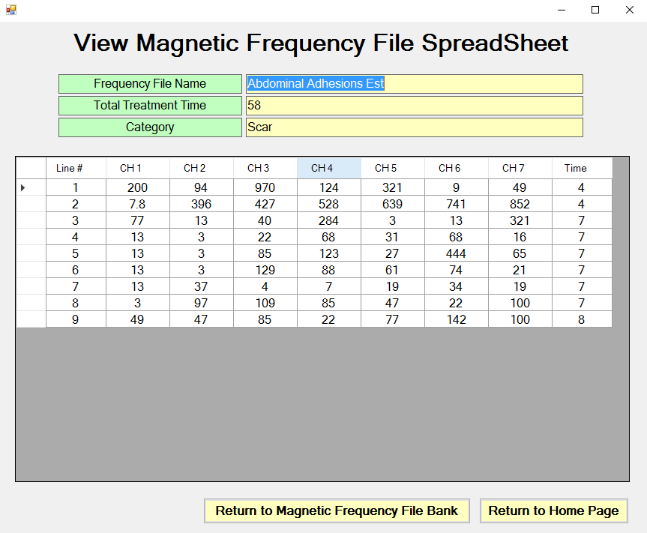 The “Create Magnetic Frequency File SpreadSheet” function allows the user to create a magnetic frequency file on a spreadsheet from scratch. 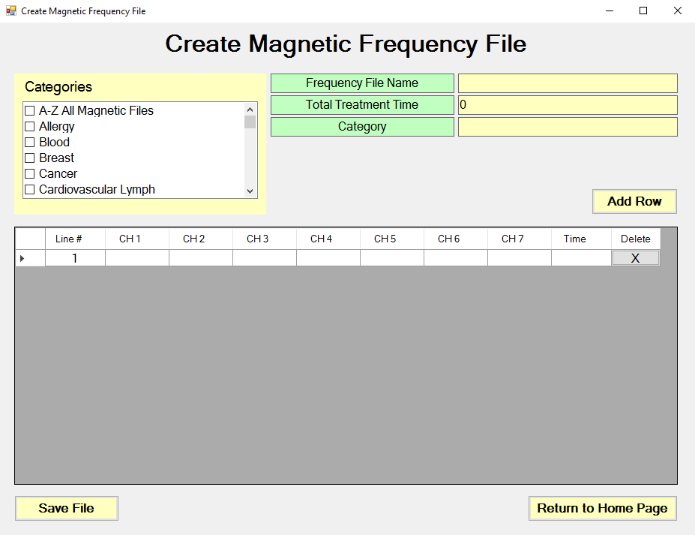 You may create your own frequency files by entering values into the empty cells in the “Create Magnetic Frequency File” table. Each row contains a maximum of seven frequencies and the time that those frequencies will be played. Each frequency corresponds to one of the seven channels that run simultaneously on the frequency generator device. A frequency must be between 0.0 and 5000.0 Hz and must be a positive number. One to seven frequencies can be entered in each row. Any channel may be left blank. Empty cells will automatically be filled with 0 when the table is saved. The time must be a whole number from 1 to 999 minutes. No decimal minute values are allowed. For example, 15.6 is not a valid entry. You may add up to 999 rows to be run sequentially. To add rows, click the “Add Row” button. As new rows are completed, the total time is calculated automatically and displayed in the “Total Treatment Time” field at the top. To delete a row, click the “X” button at the end of the row. Before the list can be saved, you will need to give it a name in the “Frequency File Name” field. You will also need to select a category from the “Categories list. When you select a category on the left, it will automatically populate category field on the right. To create your own categories, see Creating & Deleting Categories. To save your frequency file, click the “Save File” button, and the file will be added to category you selected. 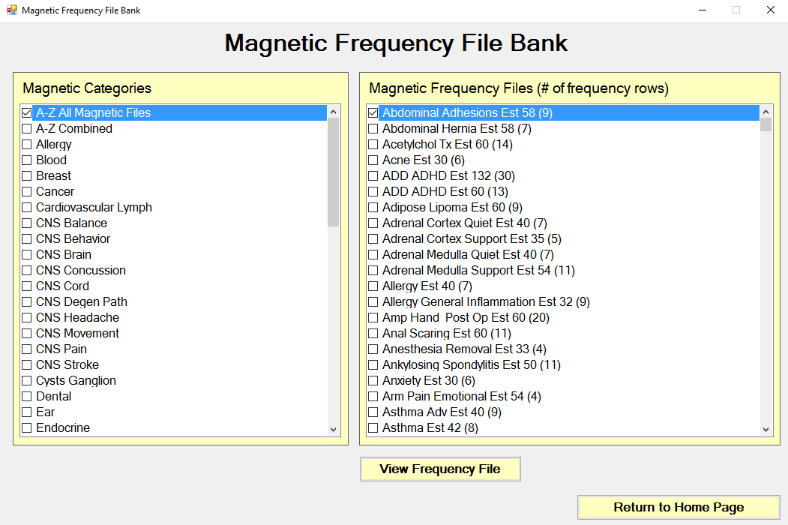 You may edit existing frequency files by clicking the “Edit Magnetic Frequency File” button on the home page to open the file bank editing dialog. 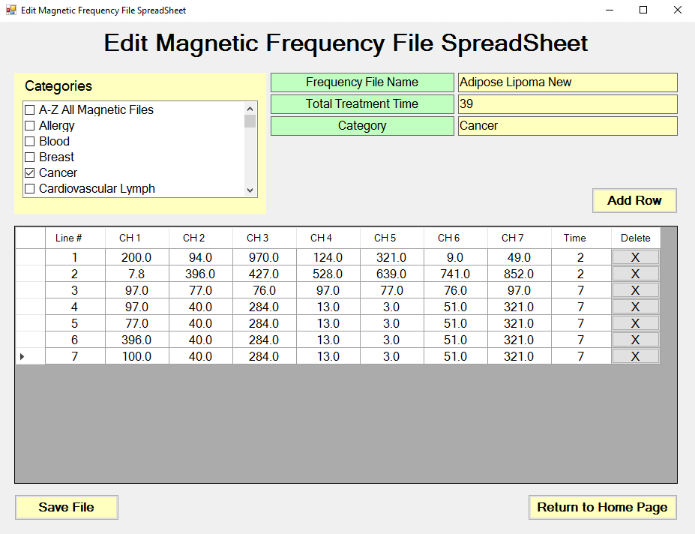 To edit a magnetic frequency file, select a file name in the right column. You may narrow the file list by selecting a category on the left. After selecting a file name, click the “Edit Frequency File” button to open the table of frequencies that constitute the frequency file. You may change frequency values and times, delete rows, and add rows. See General Guidelines for Entering Frequencies & Time for more information. Established files, files with “Est” in the frequency file name, cannot be overwritten. To edit an established file, you will need to remove “Est” from the end of the file name before saving. You may replace “Est” with “Experimental”, “New”, “Custom”, etc., or you may omit it altogether. You may change the category or leave the existing one. After you have finished editing the file, click the “Save File” button, and the edited file will be saved in the original category or the new category if you changed it. You may delete frequency files by clicking the “Delete Frequency File” button. Please note, just as established (Est) files can’t be overwritten, they can’t be deleted. You can only delete files that you’ve created or edited. Does not contain any files. Categories that are included with the downloaded file bank contain established files and cannot be deleted. To view the treatment records that have been loaded and/or saved previously, click the “Treatment Files” button on the home page. The “Treatment Files” screen lists names alphabetically in the left column. The first name in the list is selected by default. If no names have been added, the only entry listed will be “Unspecified”. To load a treatment file into your device, select the name in the left column and select the file, or row, in the right column. After selecting the file, click the “Send Treatment to Magnetic Frequency Compiler” button and follow the instructions for loading your device. Add New Name: Click the “Add New Name” button to add a name to the “Select Name” column. Once you’ve added a new name, you may save treatment files to the name. This is useful when more than one person share the software. Delete Name: You may remove names along with their treatment files by clicking the “Delete Name” button. Be mindful that all of that name’s treatment files will be permanently deleted when you delete the name. For the following functions, you may select multiple rows by clicking and holding the “Ctrl” key while left-clicking the rows you want to select. Delete Row: You may remove individual treatment files by selecting the name, then selecting the row(s) in the treatment files table, and clicking the “Delete Row” button. You will be asked to confirm with a “Yes” or “No”. After selecting “Yes”, the treatment will be deleted. Print Preview: To see a print preview, click on the treatment row(s) to highlight, then click the “Print Preview” button. Click the “print” button (printer icon) in the preview window to print or click the “Close” button to exit. Print: Select the row(s) you wish to print and click the “Print” button to print. Please note, this will send the row(s) directly to your default printer--there is no confirmation dialog, so once you press the button, the print process will begin. Save to Text File: You may create a text file by selecting the row(s) and pressing the “Save to Text File Button”. You will then be prompted to select a folder on your computer and save the file. The file bank is the set of magnetic frequency files that can be loaded into the frequency generator device. New files are periodically added to the bank, so it’s a good idea to regularly check for updates. At the very least, you will need to update the file bank upon installing the software for the first time. To update the file bank, click the “Check for File Bank Updates” button on the home page. If the file bank is out of date, you will be prompted to continue downloading the files. To take advantage of new features and bug fixes, click the “Check for Software Updates” button on the home page. If new software is available, you will be prompted to continue the software download. Then copy the “Patient” and “Patient List” folders and paste them somewhere else, like your desktop. Run the installation file after downloading--be sure that your existing software is closed before installing the new version. After installing the new version, you will be prompted to update your file banks. After your file banks are up to date, your software should be fully functional and your treatment files should appear in the Treatment Files screen. If you find that your treatment files are missing, simply copy the “Patient” and “Patient List” folders that you backed up to your desktop and paste them back into the corresponding folder (see above) to overwrite the new "Patient" and "Patient List" folders. If you find that the new version has problems or errors, completely uninstall the software and then reinstall. Before uninstalling, you must backup your treatment files, as they will be deleted when uninstalling. See instructions above on backing up treatment files. If the operation times out when attempting to load the device through the compiler, the MR7 may be in an "error state". To clear the error, simply press the power button on the MR7 and release it. You should hear a beep which indicates the error has been cleared. After clearing the error, browse to the compiler screen again and try loading the device. Please note, you will still receive an error if you try viewing the files in the MR7 ("View Frequency Files in Device" menu option) after clearing a device error--you will need to return to the compiler screen to reload, instead.